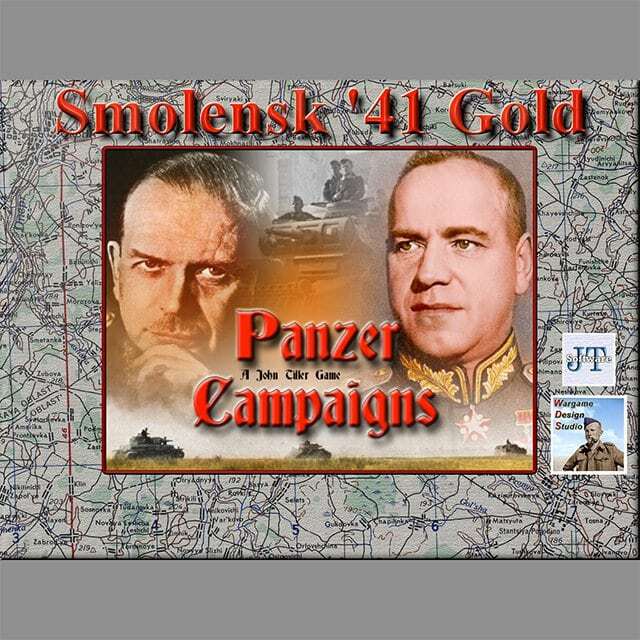 We’re proud to announce the release of the Gold version of Panzer Campaigns Smolensk ’41. 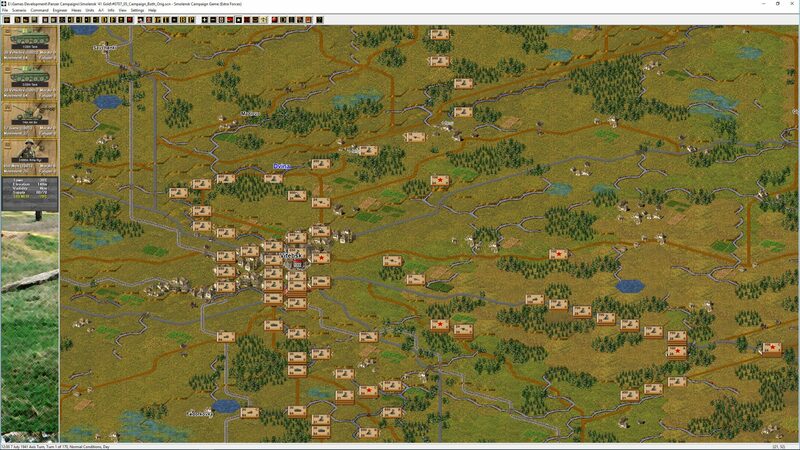 As mentioned last April, we have been working with John Tiller Software to relaunch the Panzer Campaigns series of games. All 11 games covering the Eastern Front have been updated to the Gold standard and will be progressively released shortly. We want to ensure there are no issues before releasing all of the titles and Smolensk will allow us to determine if there are any problems. 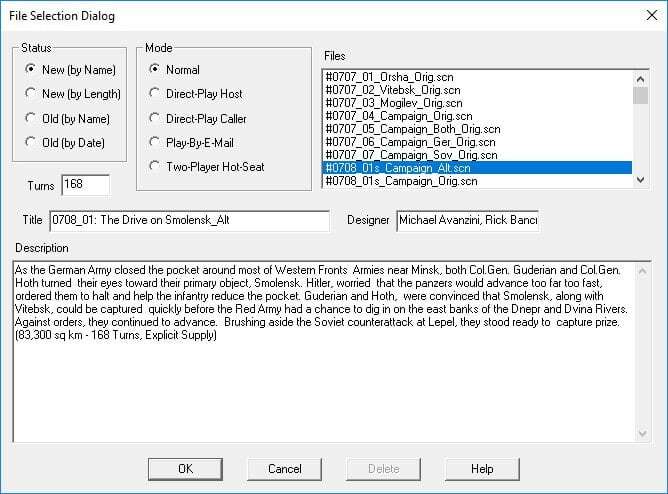 All these titles will come as either a new game replacing the existing Panzer Campaigns title for purchase or will be a free patch to existing owners. We have to go through a fairly convoluted process due to both the HPS and JTS communities, but essentially anyone with the JTS 2.00 version will get the patch and any HPS upgraders will get the brand new JTS installer and an applicable key. A single balanced play by email scenario from the Blitz. A brand-new master Map – this impacts all scenarios and there is a lot more detail on the recrafted Smolensk map. 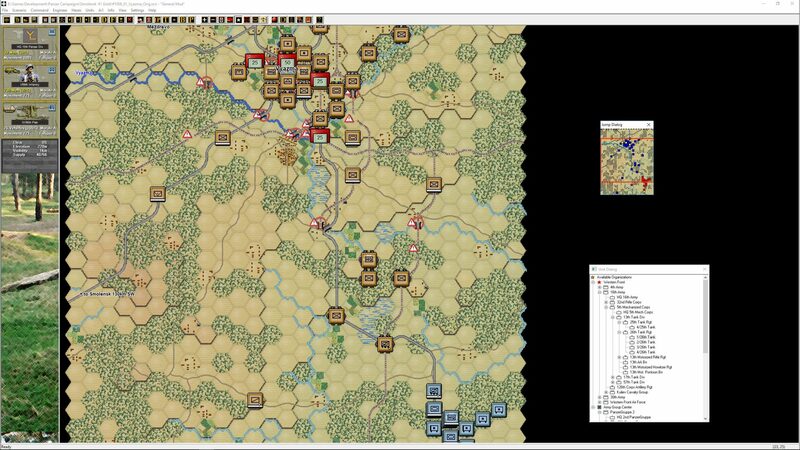 As shown, we have been focused on completing the Eastern Front games first. This has sped up the process as it’s quicker to reuse graphics across associated titles. Unfortunately, I won’t be able to work on the Western and Mediterranean games until later in 2018. With the Eastern Front done, we must double down on the North African Panzer Battles title as that has languished slightly while first the American Civil War title, Petersburg was released followed by these Eastern Front updates. We will move onto the other theatres after North Africa is released. This has been a big project and like everything taken longer than we expected. The Eastern Front covered more games than any other theatre and we knew we would get the biggest bang for the buck doing this series first. We really hope that we can breathe more life into the Panzer Campaign games as they are such a strong series. We really wanted to put the time in and update them to be more aesthetically pleasing both graphically and aurally. Beautiful. PC is a wonderful series, so even though I’m pouting for a new PB title, this makes it worth the wait. Keep the great work coming! This excels expectations. 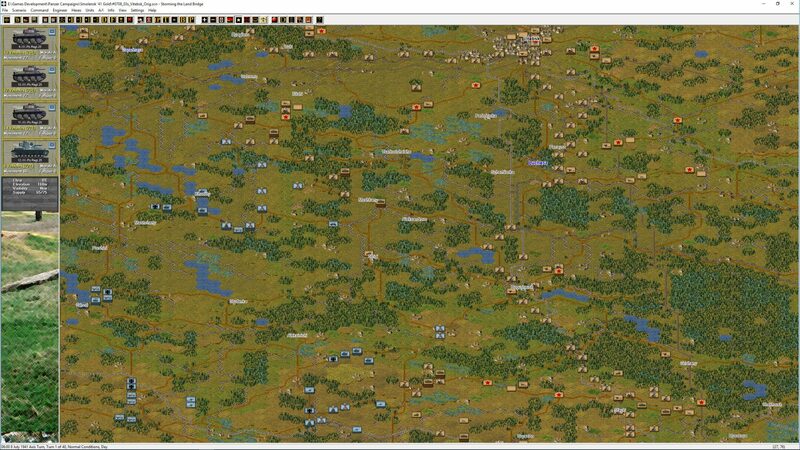 Going to love revisiting my PC Eastern Front games. Great work, David. But here’s my usual question, sorry – can the hexes be got rid of, or are they now part of the terrain graphic files (instead of edge files) – I mean, are we stuck with Jison-type hexes, which I absolutely hate? It looks like the shading in the terrain graphics now hard codes the hexes? New and revised terrain graphics for all ground states. I play all HPS maps on the OoB engine – looks better and the KI is much better !!! In addition the instruction you get when you start the installer is terribly worded. I don’t know what it’s telling me to do. It says to delete all old scenario files, then it adds ‘Only files marked with a # are relevant…’ Relevant for what? Relevant to what? What does that mean? Does it mean I ONLY delete hex marked files, or only leave undeleted hex marked files? Anyway, doesn’t work for me. I will reach out directly if your issues persist. Not certain why you would get an error message around thumbs.db – that’s a file created on your PC when you look at the files under File Explorer. To assist with the instruction – this patch only works with the JTS Smolensk ’41 2.0 version. If you have an HPS version you have to write to the JTS support account. Assuming you have the JTS version, before you patch, delete ALL the SCN files (none will have a # in front of them) and delete the Media directory. 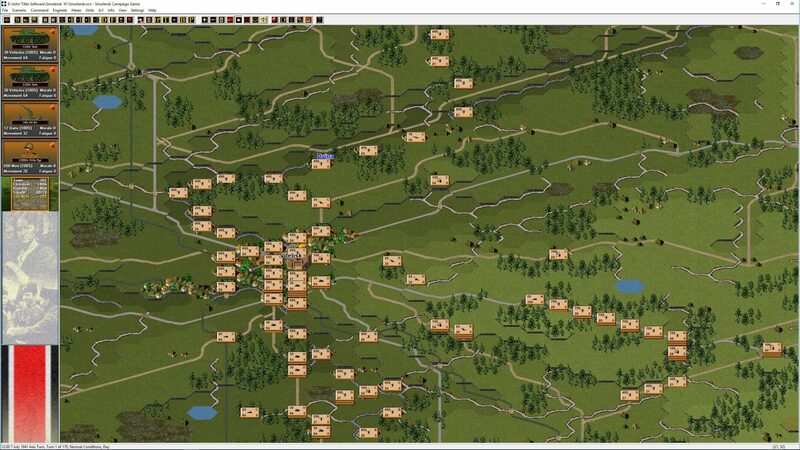 Then run the patch which will recreate your Media directory and put all the # scenarios in game. Do use the browse function to find your JTS Gold directory. If you still have issues reply here and I will email you directly. 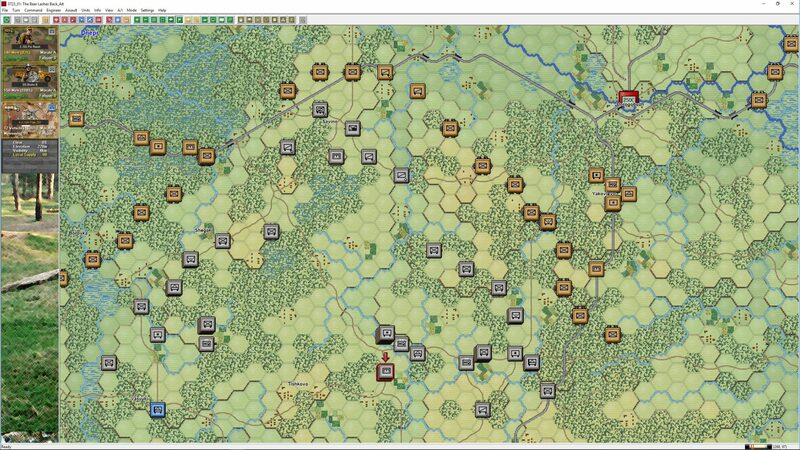 Also I think the HPS scenarios and maps – mostly on the eastern front have so many wrong deployments and wrong unit names – the maps are too rough and not exactly in details – taken from modern US maps – not from the historical soviet, polish and german military maps. In this wise its not really playable – mostly is inacceptable unhistorical ! Firstly compliments on your artwork. I have followed it with appreciation for years. There have been a range of different designers involved with the PzC engine and they have had different approaches and in some cases different scales they have applied. The Volcano Man mods moved the games over to a standard database of values and this is one of the key reasons we wanted to include those in these Gold releases. Additionally, much more research material has become available over the subsequent 17 years since release and we have tidied up areas of concern where possible. Finally as far as maps, the AMS series have always been the basis for maps, but most of these were printed in the 1945 – 1955 period, so we’re not really ‘modern’ and in many cases their primary sources were the local Soviet, British and German maps. For non-Europeans it’s hard to understand the various languages and different place naming conventions that come with the local maps. Do we get these at the JTS site? Yes – under the updates section at John Tiller’s site. If you don’t have a JTS version you will need to reach out to Support for a key to get the latest version. To reiterate again for everybody, the patch is only for the JTS Smolensk ’41 release. There is a full version of the game that will go to two different groups of people. First time buyers of the game or owners of the previous HPS release who are provided a key by Support – the support team will provide a link for download. There is a second group of people who have the JTS version and they get the patch as per the link on the update page. What about those who own those titles? Is there an upgrade cost? Or do we need to purchase the entrie game again? The upgrade is completely free for anyone that has bought the game prior. Details in the various posts here and on the Tiller site. Thanks for continuing outstanding support for the best computer wargame series out there. Gave this a spin and it is great “new” version. Sound effects are very good. The maps are very good. Understand the maps could have been less pixelated if new engine, but it is not. I think its a great job with what you had to work with. Thumbs up on the maps. Elevation is easier to note, etc. The extra highlight and view options are greatly appreciated. Love the new alternative highlighting setting. I still feel guilty about not paying something for this, because it is a must have for previous owners. Thanks a million times for this new version. The “original” map pictured here already has the Panzer Battles-style graphics, it isn’t the actual original map for Smolensk ’41. The new colour scheme seems to move closer to FWWC with brighter hexes, at least based on the screenshots shown here. It looks good, but I thought the Panzer Battles-style graphics were going to be the new standard for both the PzB and PzC series. Also: does the transportation type shown on the unit information panel match the actual movement type of the unit? 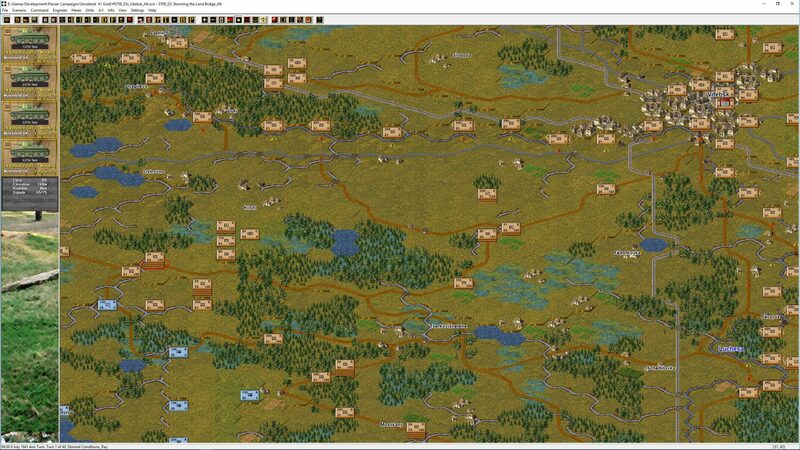 That was an issue when Moscow ’42 was updated to the Panzer Battles graphics, as units with an RSO icon actually used motorized movement when in T-mode, for example. I applaud the effort spent on keeping older titles current at no additional cost to the player. I agree that it would be nice to have the “option” of using either the PB darker style or the newer brighter map colors. It is great that there is a folder for obtaining the non-lighter center hexes, don’t know why there could not be a folder for the PB style darker hexes as well, as the map “before shot” shows. Let the player decide. I like the newer style because of the map features are easy to identify, but will admit that the bright greens and yellows create a lot of light energy from my monitor and can cause eye strain, for me anyway. Having options to decide one-self is not a bad thing. Maybe the option can be added to future versions, though mods may soon be available (one can hope). The colours for the elevations came from an official typography colour set. 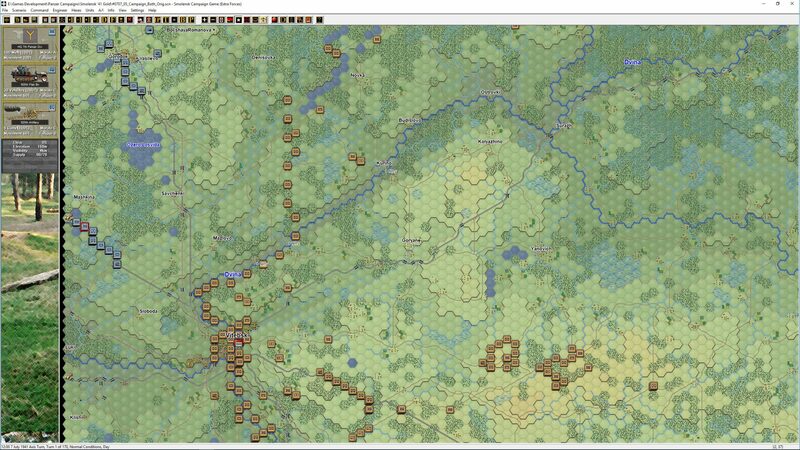 We decided to approach Panzer Campaigns (PzC) differently to Panzer Battles (PzB) in that the the 2D map in PzC was more like a typographical map and the PzC 3D was more ‘natural’ looking. We always decided that PzB would be on the natural side due to it’s scale. Unfortunately the colours Tiller released the JTS PzC titles with where from a very old PzB version that we’re pretty damn ugly. If you’re desperate to keep the old PzC graphics, it’s easy enough to copy them across from another title. The originals will work in the Gold version. Yes, I noted they can be replaced, but the newer set is just, well, cleaner. After some time with both, I prefer the newer Gold map. I’m more fond of the typographical map look. System requirements do not specify XP. Has anyone checked to see if it works? It should work, but we do not now specifically support it if you have an issue. It’s been too hard to test and maintain compatibility with the number of Window OS released since then. Apologies if this has been asked, but can Jison mapmods be used in gold versions? It appears to work on mius gold. Jison never officially supported the JTS version of Panzer Campaigns. That said there was a version that was adjusted to allow Map Mods to work and that will be the case here with the Gold version. I believe the Blitz hosts that download. The Gold version is built off the graphics changes that the JTS releases introduced. Looks great! I got into the John Tiller games when I discovered the apps on the Android play store, after I got all of them I was frustrated why this John Tiller guy wasn’t making any more apps so I googled the name and found the real games and was amazed by the size and detail. I think the only short comings in my opinion was the graphics and some unit pictures but that stuff is only 1% of the game. I love the new look and am excited to see it on the next gold releases.